I loved that I didn't see the twist coming until I was in it; even though it's all there in the title. As with Rebecca Stead's "When You Reach Me" I read the last word then promptly turned back to the beginning to see it in a new light.It's a tender, achey, pitch perfect contemporary novel for readers ten and up that deals with mental illness, poverty, grief and rage with a lightness and naturalism that demonstrates what a master of tone and plotting Weetman is. Loved the messy, hope-filled ending (without guarantees, without Scooby Doo neatness) that promises a life for the characters beyond the formal confines of the book. The devastating inferno consumed their home, the charred remains a reminder of what eleven year old Clem Timmonds has lost. Her home, her possessions and irreplaceably, her mother. Now living in a small one bedroom flat, Clem's father sleeps on the couch and provides for his daughter with the meagre, second hand possessions donated and bought. While her horticulturist father plans to return to work, Clem can no longer attend her former school with her best friend Bridge and enrols at her new school, anxious at the thought of making new friends when popular Ellie is asked to show Clem her new surrounds.Clem is adamant she won't talk about her mum but finds herself sharing her story with Ellie, about the fire and her mum who is no longer around. Ellie understands, her mother has cancer and the two new friends connect through their shared grief.Clem is a wonderful young lady, intelligent and aware, a beautifully gentle girl who is summoning her bravery after the devastation of losing her home. The parental relationship with her father is loving and gentle, he only wants to provide for his daughter and ensure she is happy and safe, going without to make the transition easier. Although he becomes frustrated with Clem's refusal to listen, he's patient and understanding of the emotional toll this has placed on his only child.I enjoyed Clem's friendship with her new neighbour Maggie, a lovingly quirky woman who also understands feelings of isolation and that tea and cake can also open the lines of communication. Maggie also provides Clem with a sense of responsibility by asking Clem to tend to her fish while she's away. Maggie's flat becomes a safe haven for Clem, who is encouraged to use the space as a means to escape for quiet reflection.Starting a new school during the school year is often a nervous time for most children, Clem is fearful of not being able to make friends and longs for her best friend Bridge and the warmth of her Chinese Australian family. Clem meets Ellie and friend Tam. While Tam doesn't hide her disdain, Ellie and Clem become friends through their shared grief and love of track athletics. Ellie is a lovely character enduring tragic circumstances, her mother has cancer and she gravitated towards Clem needing a sense of camaraderie and understanding but inadvertently, leaves Tam behind.The essence of The Secrets We Keep is rebuilding, understanding and compassion, Clem able to find forgiveness through the kindness that was extended to her. It was absolutely lovely. Nova Weetman has a remarkable style of narration, creating characters that are irrevocably flawed yet will captivate and delight readers. Sometimes a book crosses our path at the wrong time. It might be brilliant but for whatever reason the timing is off and the book falls flat or simply fails to resonate. Having discovered this a long time ago, I now know the importance of leaving such a book alone for a while, and returning to it at a later date. I call this my ‘second chance pile’. I mention this now, because this is what happened to me with this book. In doing so, it served to remind me of the power of stories to draw out potent reactions in readers that are not always positive because of the manner with which they evoke an emotional response.12 year-old Clem Timmins has lost everything; her mother, her home, her friends and all her worldly possessions. Yes, ladies and gentlemen, The Secrets We Keep is a story about loss. There are not a lot of rainbows and unicorns in this story, a fact that would normally be a good thing for me. However, when this book arrived (quite literally on my doorstep), I was grieving the death of my grandmother. Looking back, I’m not surprised that the book fell flat. A story that ached so loudly about the pain of loss was not really what I needed at that moment in time. However, I’m glad that I did recognise this and shelve it for a bit, because once I returned to it I was gifted by a story that is beautifully crafted and definitely worthy of merit.The Secrets We Keep will hold tremendous appeal for younger YA readers especially those transitioning from children’s fiction. Written in a straightforward and accessible style, the story investigates the messy stuff of parent-child relationships and touches with sensitivity on the impact of depression on families. While I don’t think Weetman’s approach is necessarily confronting, I do believe that her target audience will appreciate her frankness and will recognise that this is a rather grown-up novel (especially when compare to other novels targeted at this age group). The sensitive content in this story would deter me (or prompt me to exercise caution) from teaching this text with a large group. It is worthwhile to note that some boys may struggle to identify with the female protagonist. That said, it would be a great choice to use in smaller groups, reading circles, or as a novel designed to transition students onto more mature books.The Secrets We Keep reflects everything I love about Contemporary YA. This is the kind of story that not only do young people want to hear, but it is the kind of story that they need to hear. I read this book in a day. All of it. What a touching, emotion-filled story. I just had to know the ending! My 11 year old loved it and let me read her copy.It is well suited to 11 year olds and prompted some great conversations. No more details so I don't spoil the secrets in the book. This is a great story about a young girl confronting her anger and learning to deal with grief and finding new friends.I like that she is a runner, a great authentic activity for young people. Satisfying resolution. I don't read many books in a day - including books aimed at Middle School students. This one really touched my heart and would be perfect to read aloud to 10-12 year olds. This review will appear in Buzz Words Magazine www.buzzwordsmagazine.comIt’s been six weeks since a fire burnt down Clem’s home. Her Mum and her old life are gone. The few things she has managed to salvage carry the smell of the fire and are tainted by the memories of losing her home and her mum. Clem and father can now no longer afford to stay in the neighbourhood and are forced to move into a tiny flat so they can be closer to her father’s work and Clem’s new school. On her first day of school Clem meets Ellie and in an effort to fit in, Clem lets a secret slip about what happened to her mum which she immediately regrets. As Ellie’s mum is in hospital dying of cancer, Ellie immediately bonds with Clem over common ground of losing a mother. This connection places Clem in the awkward situation of coming between Ellie and her oldest friend Tam who becomes jealous of Clem and the changing dynamic of her friendship group. To Clem’s credit she is able to put herself in Tam’s shoes and wonders how she would feel in the same situation. Clem is helped through her struggles by her ever optimistic father who works at the botanical gardens and wears a big jacket that Clem buries her face in so she can smell his earthiness. Maggie, the neighbour in the flat upstairs, provides a refuge for Clem, offering tea, freshly baked treats and also a sense of purpose by giving her the job of feeding and caring for the fish whilst Maggie is away for work.Clem is a runner and the track is where she can be her true self, it is where all her problems float away. It is interesting to watch how Clem learns to recognise, and return to, the things in her life that bring her joy (such as running). But will Clem continue to run from her problems? Or will she find the strength to face the truth about what really happened with her mum and the fire?Reading this book brought back strong memories of my own primary school experiences; the emotions, school yard dynamics, politics and rivalries. My eleven year old self was right there beside Clem on her first day of school peering into the school playground.“And I’m out here. Looking through holes in the wire, wondering how I’m going to do this.” Nova Weetman does a beautiful job of shining a light on what it’s like to feel lost and having to fit into new surroundings when everything familiar is gone. This is a wonderfully relatable book that has strong appeal for middle grade readers. When I closed the book there was a real sense of sadness not only that the story had come to an end but that it had been resolved so beautifully. There are several reasons this became a quick fav for me (and the shop) 1) I like how Nova has drawn Clem as a character - she's extremely relatable and through her eyes we get a fresh perspective on kids living with a parent with a mental illness 2) this is not a book about mental illness, it's about a kid who gets trapped in telling a lie and living with the consequences and 3) it's a really good story! Thoughtful and touching. Full review to come.Just not sure yet about the age group - could work for years 5-9 I think. Cover appears to be marketing to younger audience but there are some weighty themes but dealt with a light touch. A great story about an eleven year old girl who loses all her possessions and has to start a new school after her house burns down. There is a lot to this book including the effects of depression, friendship and family relationships. Fire - both compelling and repelling. Catastrophic and cleansing. This basically sums up the sweep of emotions and characters Weetman explores with Clem Timmin's. Clem's secret begins with a flicker but soon ignites into something she struggles to contain after her losing her home to fire and her mother. Timmin's and her pre-pubescent peers totter on the edge of change with remarkable poise and a raw, heart-wrenching genuineness that will bring the sting of tears to your eyes and a smile to your lips. This is good old honest storytelling, where robust reality is tempered with enigmatic poignancy. Utterly entrancing. I loved it. So will older primary aged readers. This story rang true and it was absorbing. Missed the characters once it was finished.Definitely a girls' book though, lots of emotion and friend issues as well as the mum with mental health problem.Very well done. This was a lovely little tale about friendship, family and secrets. Not my favourite, but definitely one that I can see many middle readers enjoying. 3.5* A heart warming story about grief, loyalty and starting over. Well worth a read. Beautifully written book. The voice is so genuine. Highly recommended read for 10-14 years. 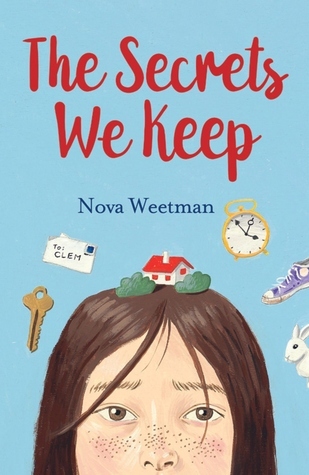 The Secrets We Keep is Nova Weetman's fifth book, and it tells the story of eleven year old Clem Timmins. She and her dad have moved to a flat after their family home burnt down. There's a bit of mystery surrounding the whereabouts of Clem's mother and it's a subject that Clem doesn't want to discuss. Clem starts at a new school and immediately makes a new friend, but she's still lonely and missing her old life, her best friend, and all the possessions she lost in the fire.From the moment I began reading I had such a clear sense of the sort of girl Clem is, she's thoughtful, loyal, clever, and it's clear she inherited these traits from her wonderful father. Their relationship was so sweet, he provided so much support for her at such a difficult time in her life. Often in YA parents are absent or just not part of the story, so it was lovely to see a positive relationship between a young girl and her dad.Nova excels at writing about female friendships with all their glorious and tempestuous complications. Clem was lonely after moving schools but gaining a friend in Ellie wasn't something she was sure she wanted, especially as she seemed to disrupt Ellie's friendship with Tam. It was nice to see Clem put herself in Tam's shoes, knowing that she wouldn't want her bestie, Bridget, to abandon her for someone new.The Secrets We Keep is a touching story of family and friendship that's honest, heartwarming, and filled with strong, lovable characters.Thank you to UQP for my review copy. A well written story which gives kids an insight into how kids have different lives to their own. It's about empathy and some of the thoughts and decisions we make. Nova Weetman - Nova Weetman wrote short fiction and children’s television before publishing her first YA novel, The Haunting of Lily Frost, in 2014. She lives with her partner, a playwright, and their two children in Brunswick, Australia.